Mord im Arosa is a quirky game with a 3-dimesional tower and unique auditory mechanic. Mord im Arosa translates to ‘Murder at the Arosa’ – the Arosa is a well known hotel in Essen, Germany where the world’s largest gaming convention is held. Someone has committed murder at the Arosa Hotel. Strangely, although the game’s theme is murder, the goal is not to discover the murderer but to avoid taking the blame. Clues in the form of wooden cubes are dropped down a shaft in a hotel tower. Everyone must listen carefully to deduce onto which floor these cubes land in order to lay the blame on someone else. Incriminating clues will rack up on an investigation sheet. Try not to make too much noise inside the hotel or you’ll rouse the suspicion of the other investigators. The player with the least amount of suspicion points at game’s end is declared innocent. Whoever scores the most points is convicted – guilty! The components feel well made and have neat illustrations. The Arosa Hotel: Boxes stacked into a tower with a hole down the middle, win. The Victims: Two red cubes, I need to find some mini-meeples to replace these. Investigation Sheet: Very clever design, it is a score board to keep track of points against you. Clue Cubes: Blue, white, yellow, brown, black, and grey … because your standard player colors are just getting old or maybe they wanted to keep me from playing my color. The game is played out in 3 stages – Prolog, Act I and Act II. Two red victims cubes along with player clue cubes are tossed down the shoot. Players investigate a floor of the hotel hoping to revel the victims. A wrong guess is a sloppy investigation and that investigator has to drop more clues from his supply down the hotel shaft. When a victim is discovered that floor is now a crime scene. ‘Conveniently’ the discoverer’s clues disappear from the scene but everyone else’s clues found on that floor are considered extremely suspicious! Players choose to either ‘cover their tracks’ or ‘suspect other players’. This is where it gets tricksy. 1. Suspect Another Player – J’accuse! Name a suspect then carefully lift the tower from that floor to reveal any colored cubes of the person(s) in question. 2. Cover Your Tracks – Have suspicious clues started piling up on the investigation sheet against you? Try to cover your tracks to remove 1 of your cubes off the investigation sheet. Any incorrect guesses and the player suffers the consequences of a sloppy investigation – more of your clues cubes go down that shaft! You may have heard that Mord im Arosa is heavily luck-based. Let me dispel that notion and set the record straight. The main mechanic is that every time a cube is dropped players must do 2 things correctly: hear where it falls and remember its location. To this consistently takes uber-concentration and a great pair of ears. Unless you are a Vulcan or have bat DNA this game becomes a press-your-luck/guessing game. Game collectors will love this game because it is unique. It brings to the table components and mechanics unlike any other game. In terms of game play and mechanics Mord im Arosa is accessible for younger gamers. Thematically however, it might not be suitable for all families. Centered around murder, the hotel is covered with seedy characters such as the the ‘woman of ill repute’ on the bottom floor. 1. When dropping your cubes try not let them tumble noisily to an obvious floor like seven or zero. 2. The rules are fairly straight forward but it is easy to play this game wrong, make sure you read carefully the numbers of cubes that are added and removed. 3. An easy way to score the game is to take all 1 point cubes and place them next to the first floor, all the 2 point cubes on the second floor, and so forth. Mord im Arosa is a casual game that is best played with at least 4 players. It’s one step up from a filler game and players should keep that in mind or else they could find it too repetitive. The components are well designed and illustrated. The uniqueness of the game makes it definitely worth a try. Mord im Arosa ("Murder in Arosa" in english) is a three-dimensional mystery game. The totally new game concept brings a thrilling and tense atmosphere to the gaming table. A player who is caught too often at the wrong time and place will be found guilty through the burden of proof. Mord im Arosa is a fun quick game that’s different than any other game I’ve played. You’re searching for a murderer, looking for clues while possibly covering up your tracks. When I first heard about it, I thought it would be a deduction game, which is incorrect. It’s not the sort of game where one person is the murderer, knows this fact, and plays accordingly. Instead, the guilty party is unknown, and “who done it” is determined at the end of the game. I’d classify it under the Party Game genre, and as being more enjoyable with more players. Each player has a set of cubes in their color. In the middle of the table sits a (thin) cardboard tower that exists in 8 square segments of differing sizes. Each segment has a square hole in the middle of its upper face (the portion within the tower), allowing cubes to fall through to the next level. This hole does not take up the entire top surface, leaving a shelf where cubes may sit. As the game goes along, players will have cubes within the tower. As you drop a cube in, you listen in hopes of being able to determine which level a cube lands on. It’s possible for cubes to fall all the way through to the bottom level (the table), though this happens much less often than I would have expected. Initially, the tower is seeded with cubes, along with 2 victim cubes (red). The first turns will consist of choosing a level, and examining it by pulling off all of the levels above it (the tower is pretty stable and rather easy to take apart to search lower levels). In Act 1 you’re looking for the victim’s bodies. If a victim is on a given level, the cube is placed on the investigation board. If not, you’ve left behind evidence you were snooping around and drop one of your cubes into the tower. In addition to the red cube being placed on the investigation board, all players who also have cubes there will take cubes from their personal supply and put them on the investigation board. Then, the cubes from the tower are taken and dropped back into the tower. In this way, cubes may be found multiple times. In Act 2 you can suspect other players, or (try to) cover your own tracks. If suspecting others, choose a floor and any number of colors. If any of the colors you named are there, that player puts cubes on the investigation board (from their personal supply) and drops the cubes from the floor back into the tower. For each color you named that are not on the floor, you must put one of your cubes into the tower. Instead of suspecting others, you can try to cover your tracks. You look at where you have cubes on the investigation board, and can name a floor to check if your cubes are on. If you find cubes of your color on that floor of the tower, you can remove cubes (1 for 1) from the investigation board. If you’re not there, you add another cube to the tower. Even if you choose correctly, the cubes from the floor go right back into the tower. Once one player has 10 cubes on the investigation board, or no cubes left in their supply, the game ends. Your overall goal is to have the fewest points worth of cubes on the investigation board. Cubes from the tower will make their way onto the investigation board as clues of who is the murderer. You want as few of cubes as possible, and to have your cubes as far from the floor with the bodies to be victorious. Points are given based on where your cubes are on the investigation board compared to where the bodies were. Same floor is 3 points, one floor away is 2 points, and anywhere else is 1. The player with the highest number of suspicion points is the murderer, who loses. The player with the lowest number of points wins. I find Mord im Arosa to have an interesting design. Listening in an attempt to determine where each players cubes end up makes for an unique gaming experience. I’m surprised how often you can be wrong, even if you’re certain you know where specific cubes ended up. It’s not a very deep game, and the rules are quick to learn. I wouldn’t say Mord im Arosa has a great amount of replay value. Each game feel s pretty similar to the last, there isn’t a lot to change it up each time. The novelty wears off after a couple of games, and the random element of dropping cubes in the tower doesn’t allow for great strategy. Since you can’t choose where to put your cubes, you’re at the mercy of how well you can determine where your cubes are, or where to find those of opponents. There is a risk/reward element to how many opponents you choose as suspects. You can play it safe naming one person, ensuring at most you add one cube to the tower. Or, you can guess a number of players, giving many people more points. The idea of Mord im Arosa is intriguing, and is a game I enjoy playing once or twice and then coming back to it a few months down the line to try again. If viewed as a Party Game, I think it has a spot in a group’s collection, but I wouldn’t recommend viewing it as more. I’d primarily play it in settings where I would play Pit, For Sale, Dixit, or Telestrations. It’s a game that is fun to try casually, but won’t stand up to repeated plays, or to scratch the itch of a deep strategic game. If you’re up for seeing how well you can determine the location of a falling cube’s landing location, Mord im Arosa is a fun diversion worth trying! 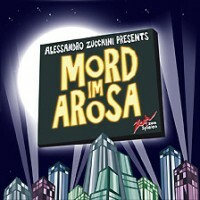 Add a Review for "Mord im Arosa"